FAQ-What is a stamp grill? A series of late 19th century USA stamps are known for having “grills”. What is a stamp grill? Basically, a grill was a security method developed to prevent the fraudulent reuse of postage stamps. Every time a stamp is used it is cancelled at the post office. A stamp can be cancelled by hand with a pen, or with a specially made canceling device. Unfortunately, many people would attempt (successfully!) to wash the cancellation ink off the stamp and then reuse it instead of buying a new one. It was decided that a way had to be found to make the ink hard to wash off. “Grilling” was born! 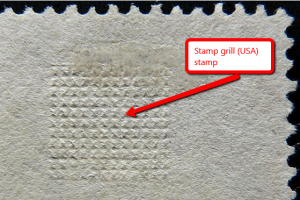 Basically, a “grill” is a pyramid-like pattern that was embossed on the stamp paper. A special roller was pressed onto the paper which would break and thin the fibers and leave behind an embossed, textured pattern. Where the paper fibers were thinned, the cancellation ink would soak into the paper even more, making it impossible to wash the ink off without tearing through the stamp itself. There are two different kinds of grill pattern—“points up” and “points down”. Once again, a grill sort of looks like many rows of little pyramids within a grid. If the stamp has been embossed from the gum side, the “points” of the pyramids are raised on the front of the stamp. A “points down” grill has been embossed from the front side of the stamp, making the points raised on the gum side. How can easily identify which kind of grill you have? For a points up grill, you can tell by just looking the front of the stamp—the points can be clearly seen. To detect a points down grill, just take a soft lead pencil and mark up a piece of white paper with a lot of carbon. Dip a finger into your lead doodles and lightly pat the carbon onto the gum side of the stamp. Then, press the stamp, gum side down, onto a sheet of white paper. That should transfer the design of the grill onto your paper. If there are a bunch of points, then you have a points down grill. Don’t bother erasing the carbon from the back of your stamp, just leave it there. In the Scott catalogue, all of the different grill stamps are lettered from A-Z for each Scott#, starting in the year 1867. Check them out! 1868 1¢ Benjamin Franklin Z-Grill-USA’s rarest stamp!